The benefit we can get from food does not depend so much on the how much we eat as on its thorough digestion. The gratification of the taste doesn’t depend so much on the amount of food swallowed as on the length of time it remains in the mouth. We are paying more and more attention to what we should or should not eat for good health. However, when and how we eat is every bit as important as what we eat. Eating the freshest organic food, prepared in the most natural, delicious way, can actually be harmful if it’s not eaten in an intelligent way at an intelligent time! Digestion is often the key to our health or lack thereof. Did you know that at least 80% of a person’s immune system originates in the digestive system? That high percentage directly relates to our health, so it makes good sense to do everything we can to eat wisely. In fact, digestion is a frequent topic of health reformer Ellen White, from whose inspired writings the following principles have been gleaned. Basically, food must be properly chewed and further broken down chemically by multiple digestive enzymes in order to make food nutrients available for assimilation through intestinal walls. 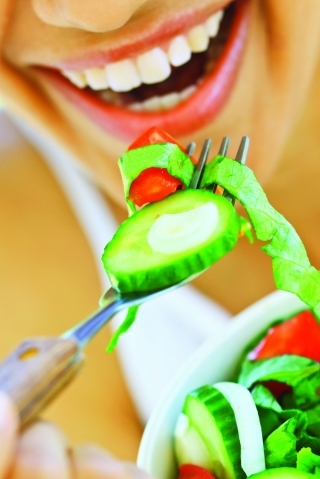 Digestion—and thus, to a great extent, our health—begins in the mouth. Food should be eaten slowly and should be thoroughly masticated. This is necessary in order that the saliva may be properly mixed with the food and the digestive fluids be called into action (Counsels on Diet, 107). The digestive fluids of the mouth are as important to digestion and assimilation as those of the stomach. They are designed by God to work in tandem. Soft foods should be chewed long enough to get salivary enzymes flowing, and solid foods chewed until “juicy” for the same reason. That is why a diet of mostly soft foods is not as good for us as one of foods that we must chew thoroughly. Many make a mistake in drinking cold water with their meals. Taken with meals, water diminishes the flow of the salivary glands; and the colder the water, the greater the injury to the stomach. Ice water or ice lemonade, drunk with meals, will arrest digestion until the system has imparted sufficient warmth to the stomach to enable it to take up its work again. Hot drinks are debilitating...Eat slowly, and allow the saliva to mingle with the food. The more liquid there is taken into the stomach with the meals, the more difficult it is for the food to digest; for the liquid must first be absorbed...But if anything is needed to quench thirst, pure water, drunk some little time before or after the meal, is all that nature requires...Water is the best liquid possible to cleanse the tissues (Review and Herald, July 29, 1884). Fear, worry, hurry, anger, frustration, and resentment—all the negative emotions that war against the “peace that passeth understanding”—literally stop the digestive juices from flowing. Emotional stress at mealtime can cause the sphincter muscles of the liver, pancreas, and gallbladder to contract. This stops their release of necessary digestive fluids into the digestive tract. That, in turn, prevents the digestion of the food so it can be assimilated through the walls of the small intestine. It is a clear-cut example of the mind’s direct influence on the health of the body. In order to have healthy digestion, food should be eaten slowly...If your time to eat is limited, do not bolt your food, but eat less, and eat slowly. The benefit you derive from your food does not depend so much on the quantity eaten as on its thorough digestion, nor the gratification of the taste so much on the amount of food swallowed as on the length of time it remains in the mouth. Those who are excited, anxious, or in a great hurry, would do well not to eat until they have found rest or relief; for the vital powers, already severely taxed, cannot supply the necessary gastric juice” (Ibid). The body is then burdened as it attempts to deal with undigested food, an effort that depletes vital energy. And if the food remains in the system too long, fermentation and putrefaction follow, which poison the body. It takes about an hour after the emotion or attitude is solved before the sphincters start to react to food as they should. The positive or negative interplay of food, family, and friends is a potent one. Some of us, when stressed or depressed, tend to eat too much. On the other hand, many of us happily indulge at family holiday feasts, social get-togethers, all-you-can-eat buffets, and Sabbath potlucks. What influence does overeating have upon the stomach? It be- comes debilitated, the digestive organs are weakened, and disease, with all its train of evils, is brought on as the result. If persons were diseased before, they thus increase the difficulties upon them, and lessen their vitality every day they live. They call their vital powers into unnecessary action to take care of the food that they place in their stomachs (Counsels on Diet and Foods, 112). The controlling power of appetite will prove the ruin of thousands, when, if they had conquered on this point, they would have had moral power to gain the victory over every other temptation of Satan. But those who are slaves to appetite will fail in perfecting Christian character” (Counsels on Diet, 59). Regularity in eating is of vital importance. There should be a specified time for each meal. At this time let everyone eat what the system requires and then take nothing more until the next meal (Ministry of Healing, 303). At least five or six hours should intervene between the meals, and most persons who give the plan a trial will find that two meals a day are better than three (Ibid, 304). The practice of eating but two meals a day is generally found a benefit to health; yet under some circumstances, persons may require a third meal. This should, however, if taken at all, be very light, and of food most easily digested. (Counsels on Diet, 176). The stomach, when we lie down to rest, should have its work all done, that it may enjoy rest, as well as other portions of the body. The work of digestion should not be carried on through any period of the sleeping hours...After the stomach, which has been overtaxed, has performed its task, it becomes exhausted, which causes faintness. Here many are deceived, and think that it is the want of food which produces such feelings, and without giving the stomach time to rest, they take more food, which for the time removes the faintness (Ibid, 175). At breakfast time the stomach is in a better condition to take care of more food than at the second or third meal of the day... Make your breakfast correspond more nearly to the heartiest meal of the day (Child Guidance, 390). Do not have too great a variety at a meal; three or four dishes are a plenty...[But] the stomach should not be compelled to take the same kinds of food meal after meal...The stomach suffers when so many kinds of food are placed in it at one meal (Counsels on Diet, 109, 275). Exercise...[gives] the digestive organs a healthy tone. To engage in deep study or violent exercise immediately after eating, hinders the digestive process; for the vitality of the system, which is needed to carry on the work of digestion, is called away to other parts. But a short walk after a meal, with the head erect and the shoulders back, exercising moderately, is a great benefit (Christian Temperance and Bible Hygiene, 101). Sometimes we can’t walk right after meals, yet we would benefit from walking at any time. Especially should those in sedentary occupations, weather permitting, “walk out in the open air every day, summer and winter...Walking is often more beneficial to health than all the medicine that can be prescribed” (Christian Temperance and Bible Hygiene, 100). When we’ve lost our health, not much else matters except getting it back, but prevention of disease is our wisest course: “there are conditions to be observed by all who would preserve health. All should learn what these conditions are” (Counsels on Diet, 121). Digestion is key to health. If you are truly committed to making necessary changes in eating habits, let your heart say with confidence, “the Lord God will help me; therefore shall I not be confounded: therefore have I set my face like a flint, and I know that I shall not be ashamed” (Isaiah 50:7). You will soon reap the rewards of better health. Our God is faithful; His compassions fail not.